I finally scrapped something after almost a month of not getting near my papers and mediums and scrappy stuff! 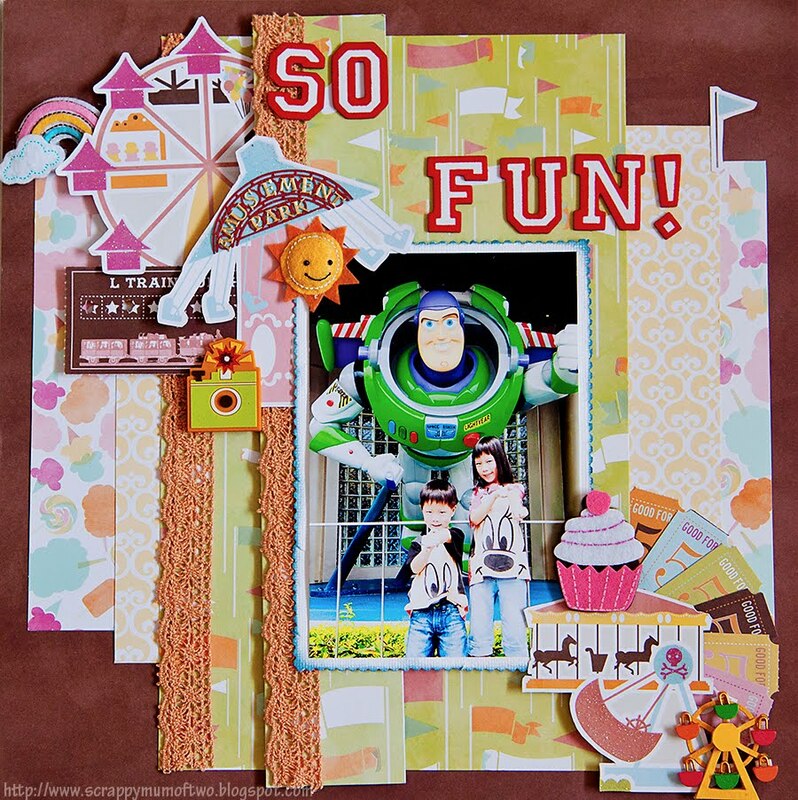 There was a rush of joy as I finally put together a layout after the hubster brought the kids out for a swim and lunch. Thank God for the hands-on daddy! As the June holidays draw to an end over this weekend, I find myself beginning to miss the kids already. When they are around, I am kept busy on my toes and the house is so noisy with their shouting and laughter and my screams. However, when the kids are at school, I find myself wondering if they are coping alright, eating well and handling any situation properly? I scrapped a photo of the kids with Buzz Lightyear at Hongkong Disneyland. Asher loves this character, and sometimes even sign off as 'Buzz Lightyear' on his homework. The kids really enjoyed Disneyland though it was a smaller theme park and we visited the park for 2 days since we had a discounted 2-day pass to the park. The hubster and I just trudged our tired legs along with them, following them to the various station games they were interested in playing. 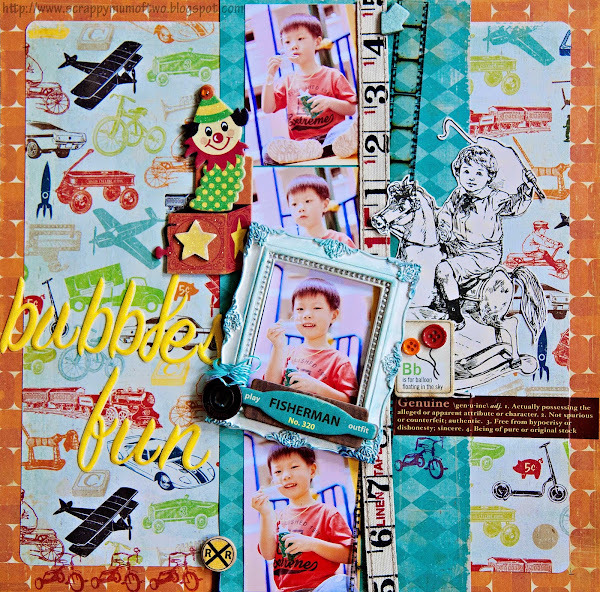 I used another sketch from Creative Scrappers for this layout again and modified it a little. The papers were from S.E.I and had just arrived at MWL last week. 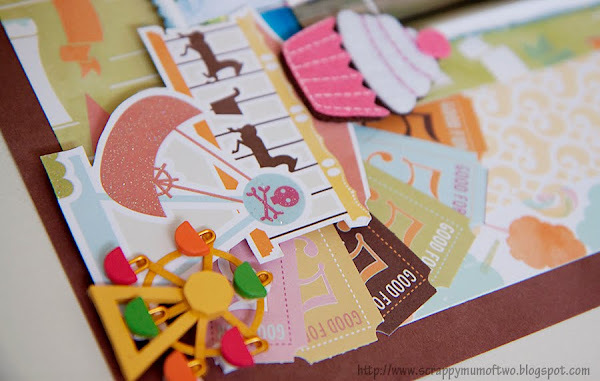 I was delighted to find the series of amusement park- themed papers which were a perfect match for my disneyland photos! 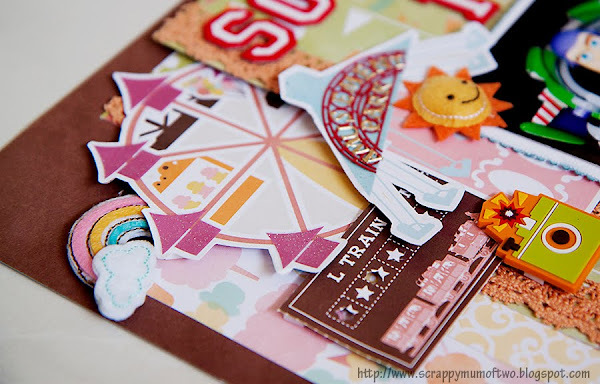 Some close-ups...lots of layering of papers and embellies as usual...I love that little ferris wheel wooden sticker. I had gotten the sticker from Tokyu Hands 2 years ago when we visited Osaka! Lol, what a hoarder I am! Some puffies and rubber stickers from K.I and K & Co. that I have been hoarding forever too! We are back from our Hongkong trip! It was fun though I came down with flu just a day before we left for Hongkong. Thank God by the time we were at the Disneyland Resort, I was recovering and I am really happy to see the kids enjoying themselves so much despite the hot, hot, hot weather. I feel blessed whenever I see their father being hands-on with the kids, monkeying around with them and accompanying them on rides despite his tiredness. He may not be the best care-giver but he is definitely the playful parent between us and I am amazed at how he keeps up his energy levels entertaining the kids! 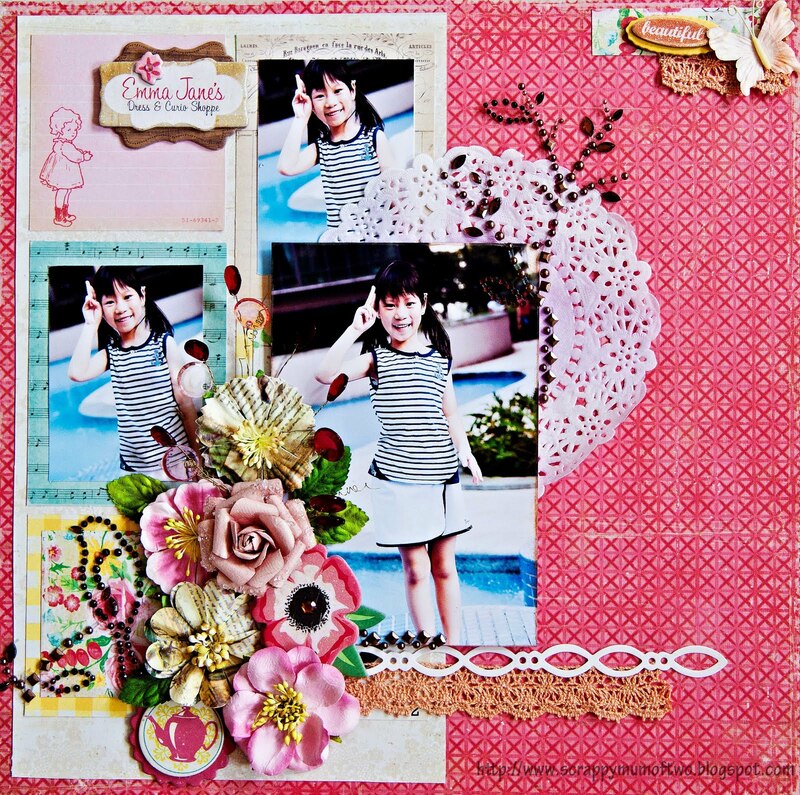 I completed this layout for Made With Love before we left for our holiday. This is Asher, sitting contentedly at the the top of a slide at the playground near our place and blowing bubbles away. 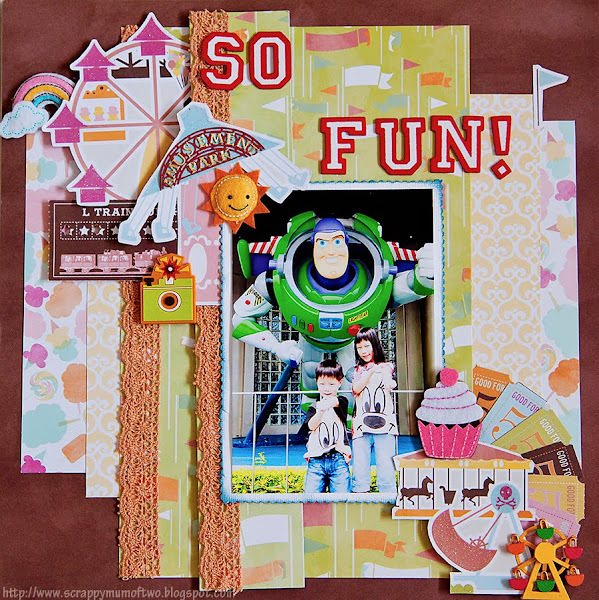 I used Crate Paper's Toy Story Collection and added a Melissa Frances frame to draw attention to my favourite pic. 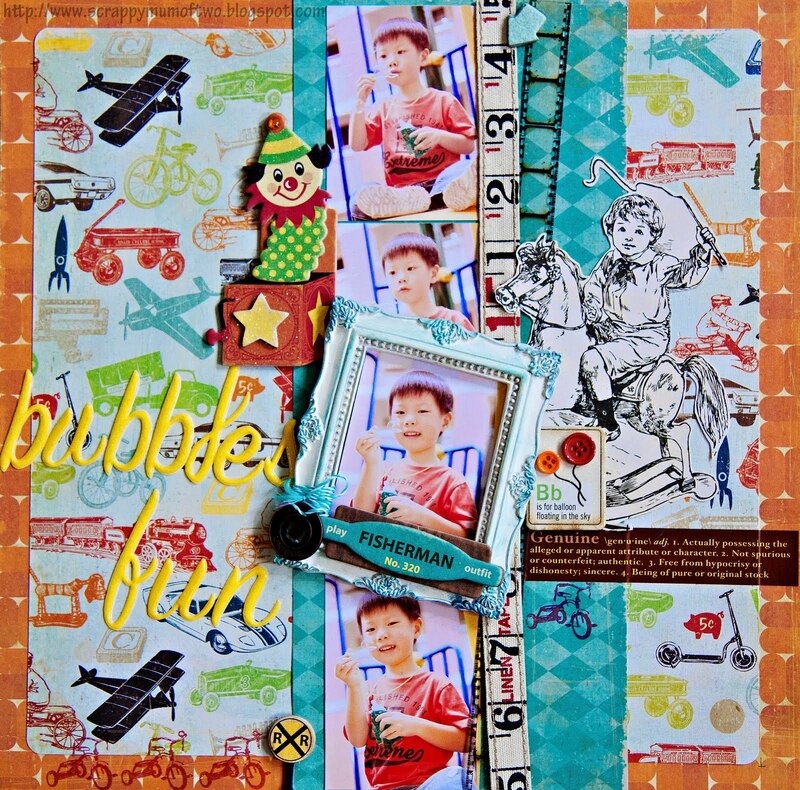 I also used the Tim Holtz ribbon and film tape, love how versatile they are especially on my boy's layouts! 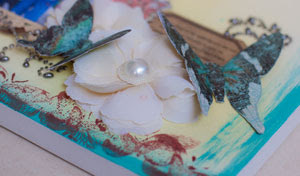 I had distressed the frame with blue Versamagic ink, Tim Holtz distressed inks in blue and tied on the metal charm with blue baker's twine. 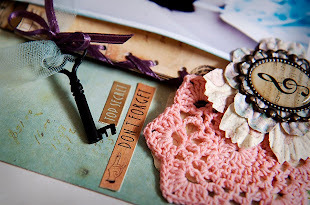 This is a really simple layout, put together quickly in less than three hours. 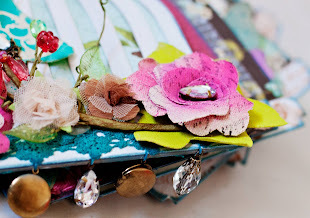 I don't like flowers on boy's layout and I kept the embellishing simple as I did not want to take away the attention from the vintage toys background paper. Thanks for coming by to visit! Have a great week ahead and enjoy the June holidays!